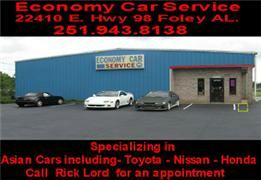 At Economy Car Service, we can help you assess your problems and get you on the road quickly. Since 1984 we've provided our customers with honest pricing, excellent service and even better customer service. Economy Car Service is family owned and operated and we use the latest diagnostic equipment to guarantee your vehicle is serviced correctly while maintaining your manufacturer's warranty. Call us at (251) 943-8138 to schedule an appointment or stop in and talk with an expert to find out what Economy Car Service can do for your vehicle.